The river, which is 500 meters long, looks like the Milky Way, with thousands of stalactites and stalagmites on either side of it. Entering the Thien Ha cave in Son Ha commune, Nho Quan district, Ninh Binh province, you will see a galaxy in the mountain formed by magic stalactite blocks. 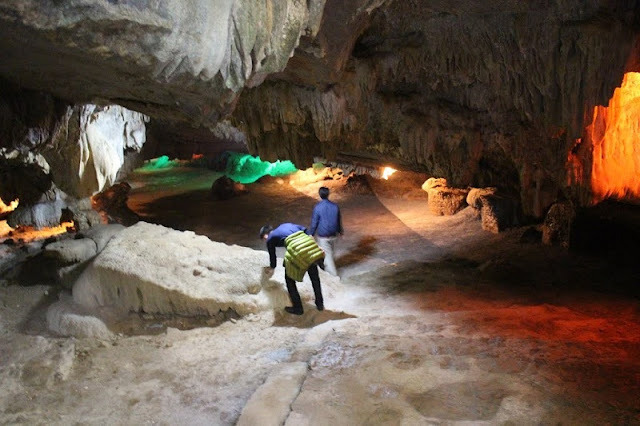 The Thien Ha cave is hidden in the heart of a mountain range to protect the ancient capital of Hoa Lu in the time of King Dinh Tien Hoang and Le Dai Hanh in the tenth century. Setting foot on a water stream of 500 meters long, visitors are overwhelmed before the illusory and magic stalagmite formations. The world of rocks in various shapes as portrayed in 3D movies with the tigers, elephants, monkeys. In the dry cave, travelers are dazzling at the unique sculptures of the Creator such as: castle, propeller, human organs such as ear, nose, etc. The sky well is wide and nearly 3m high where sunlight shines down to the cave. The river, which is 500 meters long, looks like the Milky Way, with thousands of stalactites and stalagmites on either side of it. Thumping the rock produces sounds like a melodious song which helps the visitors forget all the worries and troubles. Underneath the reflecting water, sparkling light on them makes the scene shimmer. The hermitically curved and endless galleys with colorful layers of stalactites and stalagmites, as well as legends about the island of Lotus, Mother Milk, etc. make visitors feel lost in the spiritual world. Probably because of that, people named the cave Thien Ha or Galaxy. And even better, by the ups and downs of time, the cave still retains the pure pristine beauty. The cave is a forever home of thousands of bats. Scientists have also discovered traces of ancient Vietnamese and other animals such as tortoises in the cave, demonstrating that Thien Ha was the safe and ideal shelter of the ancient people. From the beginning to the end of the Thien Ha, there are the perfect views that visitors cannot take their eyes off, and admire the Mother Nature arrangements. Apart from typical Ninh Binh trips such as Tam Coc, Trang An, Hang Mua, Ninh Binh has many interesting and interesting destinations waiting for you to discover.